It sounds as though Cook wasn't too impressed, but that's probably the wrong conclusion to draw. 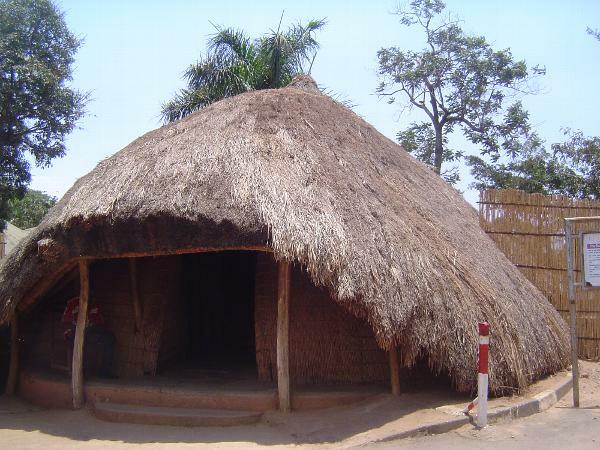 Elsewhere in the same book, he writes that "largely hidden by the [banana] trees were many native huts of the familiar beehive shape, constructed on a basket work of palm poles and reeds, devoid of windows but with a large doorway and a thatch most neatly put on and extending down to the ground. In the better classes the inside was kept scrupulously clean, the stamped mud floor being carpeted with dry sweet smelling grass arranged with the stalks laid parallel. A fireplace was formed of four palm poles placed in a square of three or four feet each way: the smoke was allowed to make its way out through the thatch. The interior of the hut was divided into three or more rooms by hanging bark cloth curtains" (Cook, p. 44). This hut is the gatehouse of the Kasubi Tombs, a World Heritage Site.